With more than 1,000 individuals seeking food assistance from the Franklin Food Pantry, a movement is underway to educate the community about the level and impact of hunger in Franklin. A dinner featuring a simple meal of soup and bread will set the stage for community members to learn more about the true effects of hunger. The 2nd Annual Empty Bowls Dinner on May 2, from 6 – 8 p.m. at Franklin High School will remind guests of the many “empty bowls” that exist in the lives of those who experience hunger. 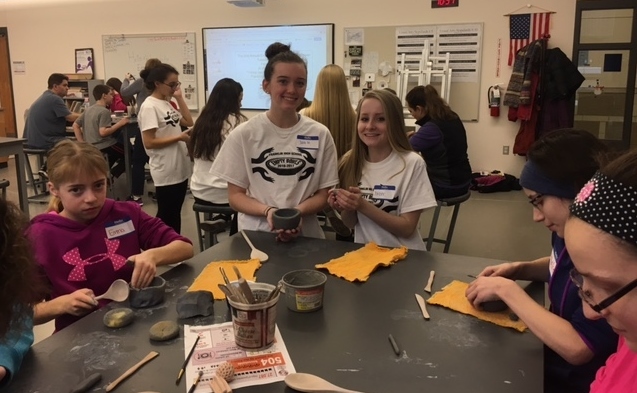 The awareness and fundraising event, co-hosted by the Franklin High School Empty Bowls Club and the Franklin Food Pantry, is a family-friendly event and caters to all ages. Lynch said she is grateful for the partnership with the Franklin High School Empty Bowls Club. Students have been making ceramic bowls throughout the year to be used at the dinner. They have also hosted bowl-making events open to the community. Event participants will choose a hand-painted, ceramic bowl to take home as a reminder that “somewhere, someone’s bowl is empty.” A silent auction will feature more elaborate pieces that have been created and painted by members of the FHS Empty Bowls Club and community members. Donations made via the Giving Wall will be used to purchase food for neighbors in need. All proceeds from the event will benefit the Franklin Food Pantry and will be used to fight hunger locally. Tickets will be available for purchase on April 1 and must be bought in advance online at www.franklinfoodpantry.org. Seating is limited to 350 guests so tickets will be sold on a first-come, first-served basis. Depending on advance ticket sales, tickets may be available at the door. The cost is $20 for adults and $10 for children and students.